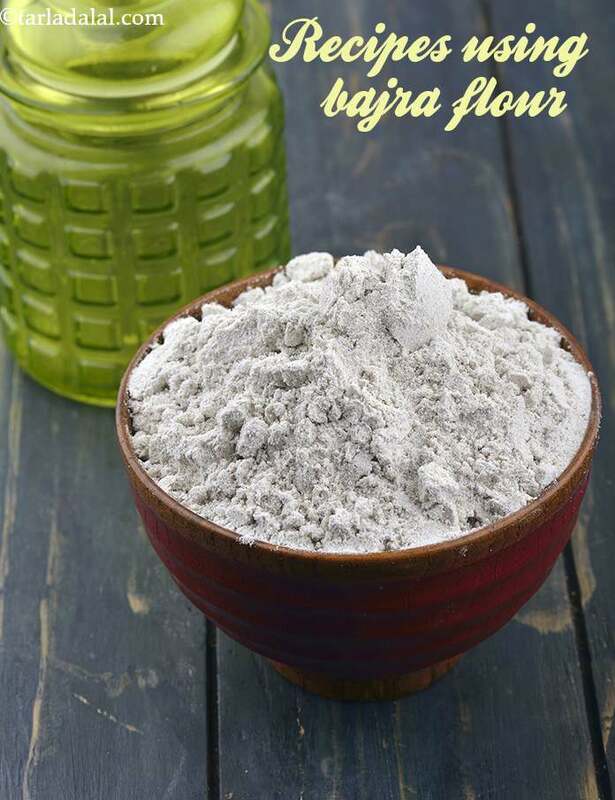 indian bajra flour recipes. pearl millet recipes. Millets are small-seeded grasses and can substitute rice and wheat in almost all the recipes. They include Jowar (sorghum), Ragi (finger millet), Thennai (foxtail millet), Varagu (kodo millet), Sama (Little Millet), Bajra (Pearl Millet), Barr (Proso Millet) and Sanwa (Barnyard Millet). They have high resistance against harsh climates so, they can be grown easily. They are fibrous, highly nutritious, gluten-free and contains many micronutrients like magnesium, Vitamin B3 etc. Pearl millet (Bajra) is the most widely grown type of millet in India. It is a rich source of phosphorus, folic acid, zinc, iron, multivitamins etc. Consumption of pearl millets helps in minimizing the risk of type 2 diabetics. They are easy to digest, reduces blood pressure and risk of heart stroke, optimizes cholesterol and the list is never-ending. Bajra flour is made by grinding the Pearl millet (Bajra) grains. It is greyish in color and has a nutty flavor. Always store it in an air-tight container in a cool, dry place and consume within a month. Confused about what to do with the whole bajra apart from making the mainstream khichdi’s? Grind pressure-cooked bajra along with spices to make fluffy Bajra Carrot and Onion Uttapa and serve them with healthy green chutney. The carrot and onions give a crunch to the dish and also lifts the flavor. This makes up for a healthy breakfast. Just like Thepla is to Gujarati's, Thalipeeth is to Maharashtrian's. Try this traditional Marathi breakfast which has a rustic texture and is extremely nutritious. Extremely hungry and running out of time? Try Lehsuni Bajra Aur Kaddu ki Roti made using a combination of Pumpkin and Bajra with a hint of garlic for your quick meal or Jowar Bajra Garlic Roti if you don’t like pumpkin. The combination of bajra flour with garlic is always amazing. Do try using fresh garlic during winters and also smear some ghee for the final touch for a better version! Also, the Bajra Aloo Roti is comparatively a healthier version of aloo paratha. Relish it hot with a bowl of curd. Forget calorie loaded, deep-fried snacks and munch on snacks made with bajra flour guilt free. Chakli are irresistible, savory, spirals made using different flours. We have made a fiber-rich version Bajra Chakli which is better than most other snacks. You can also make healthy Bajra Methi khakhra in bulk and enjoy them whenever you crave something crispy! Binge on these healthy delights during office hours or movie marathons. Dhebra is an authentic Gujarati tea-time snack. They can be made using just bajra flour or a mixture of different flours. You would have surely heard about the popular Kofta kadhi and Kadhi pakodi. We have made a healthier version of kofta's which are steamed and not fried to make Veg Methi Kofta Curry. It makes for a perfect accompaniment to a hot bowl of khichdi. While adults will enjoy khichdi without any complains, kids will want something fancy. Worried about your kids consuming a lot of refined flour? Try this gluten-free Bhakhri pizza recipe with the goodness of pearl millet. Moong Sprouts and Bajra Pessaruttu, Stuffed Bajra Parathas are my other favorite healthy dinner options. Enjoy our bajra flour recipes collection below.